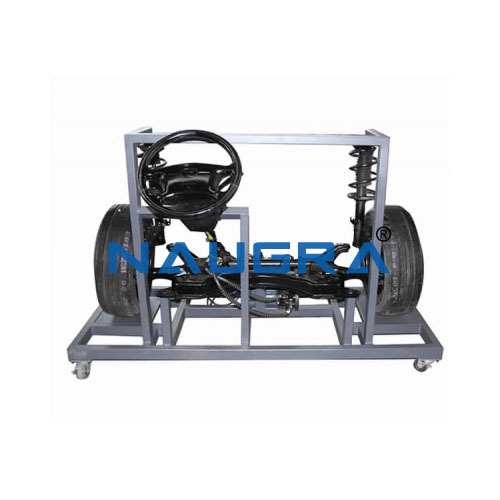 Training Workbench for Hydraulic Power Steering System. The training platform selects a hydraulic power steering system with complete accessories,. When compared to non-power steering and power steering, it fully demonstrates the work process and steering principles, application and changes. This system is suitable for automotive steering system construction and maintenance training, and practice teaching in middle and advanced vocational and technical schools and training institutions. 1. The motor drive power steering pump fully demonstrates the work principle of power steering. 2. The panel is equipped with a pressure gauge to display value changes of oil pressure. 3. The dial under the wheel displays steering angle dimensions. 6. Fault setting and assessment system (see fault setting and assessment system introduced).